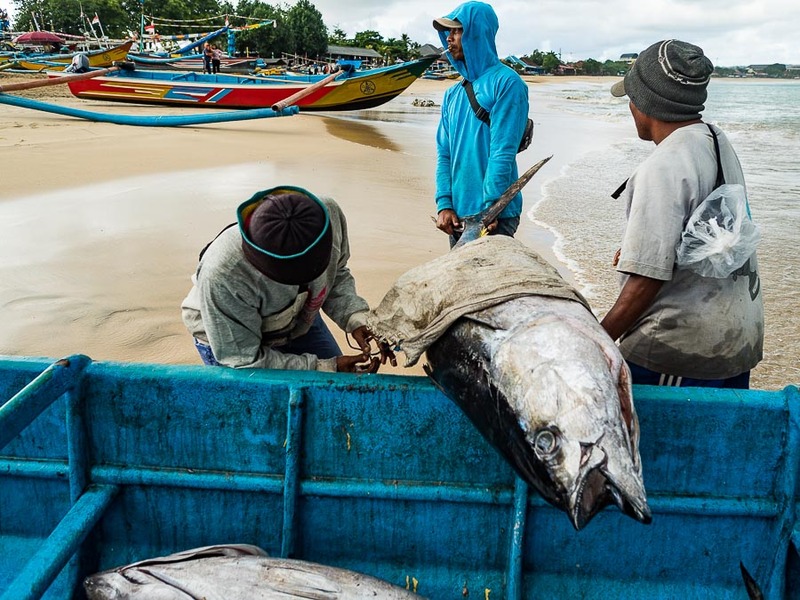 Workers carry yellowfin tuna ashore at a fish market in Kuta, near the airport in Bali. 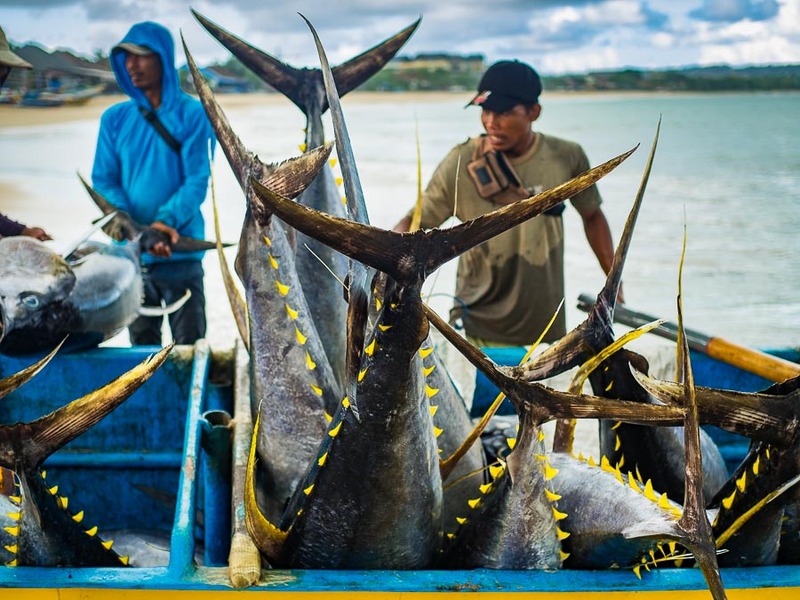 The fishing waters in the Pacific Ocean near Indonesia, Thailand and the Philippines are some of the richest in the world. I wanted to photograph fishing boats coming ashore in Bali so we went to Kuta to see what we would find. 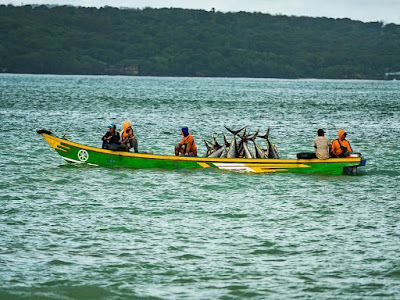 I was hoping we would see the smallish (two or three man crews) outrigger canoes coming in, but that wasn't happening. Instead we saw small outriggers bringing in dozens of fresh caught yellowfin tuna. I think the fish were caught on trawlers and transferred to the small outriggers just over the horizon because the boats bringing the tuna in were far too small to land the fish and some of the fish were already frozen and the outriggers don't have the wherewithal to freeze the fish. 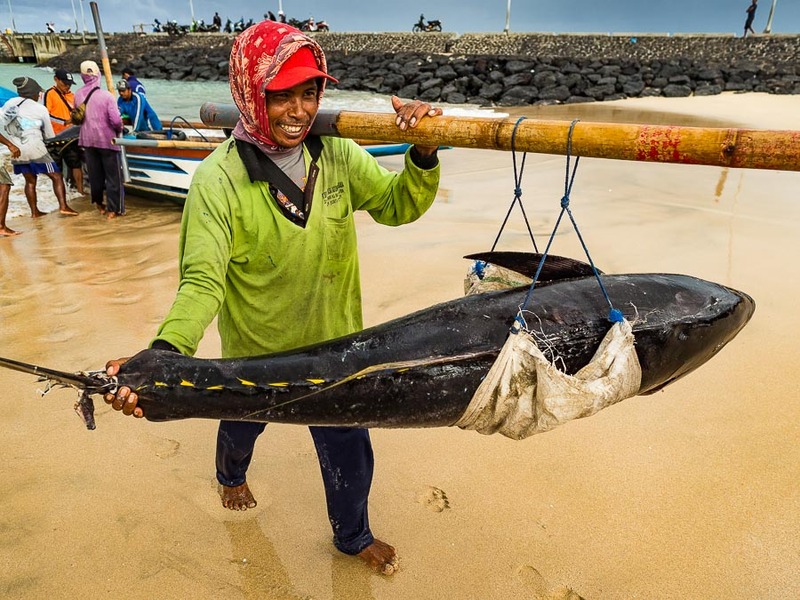 Yellowfin sticking out of an outrigger coming into the Kuta beach. Although this isn't what I set out to photograph, it was worth the trip. Yellowfin are some of the most sought after fish in the ocean. They're extremely popular in Japanese sushi and sashimi places. As the small boats landed, men lined up with bamboo poles. 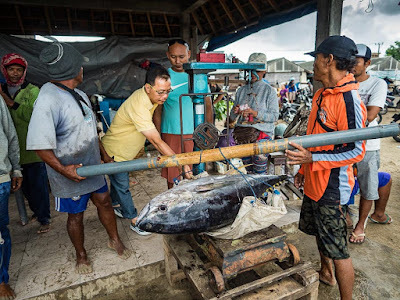 The fish were hung from the poles and men carried them up beach to a buyer who graded the fish on the spot and determined which were exported and which would stay on Bali. The small yellow fins are how the yellowfin got their name. Fish in an outrigger ready to be offloaded. 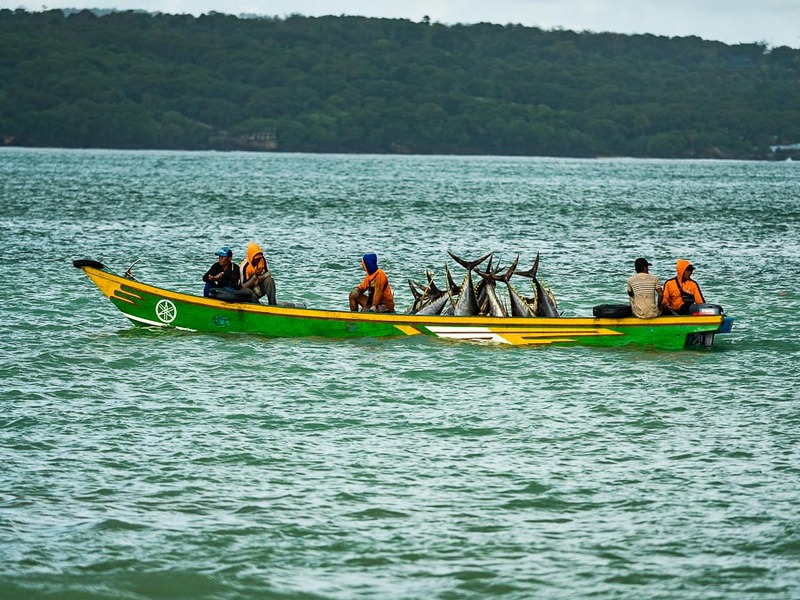 Men wrestle a yellowfin out of the small outrigger. It was slung from a pole and two of the men carried it up the beach to a waiting buyer. This was really globalization in real time. These fish would be on a table in Japan in less than a day (the Bali airport is just a couple of kilometers from the fish market). A buyer (in the yellow shirt) grades a fish. Other types of fish were being brought ashore. Most I didn't recognize and the smaller ones never even made it into the fish market. Women set up and sold them on the beach. In addition to the tuna, the boats were landing huge marlin. The foreign buyers though were only interested in the yellowfin.